When friends or relatives visit from abroad, there’s only one place I send them, Camden Market. Be it a 50 year old or a 5 year old, Camden is one of my most favourite places in London. You’ll find everything there from vintage clothing to scrumptious street food, so you can’t go wrong in NW. Keep walking past the array of shops and tattoo/piercing parlours and you’ll come across the Stables Market, my area of interest. Inside of these walls, you’ll find a variety of food stands – Chinese, pizzerias, Indian, Crepes etc. Walk through these stalls and you’ll come across various market merchants selling vintage & new merchandise. As much as I was tempted to visit Camden a couple of hours earlier to scour through the jewellery stands, BW and I were here just for the Gilgamesh restaurant. After finally finding parking after 20 minutes, we quickly found the restaurant situated right at the front of the Stables Market. The immense detailing of the restaurant began from just the outside, with the funky wooden carvings covering every single wall and corner of the entire inside. Walking in, the buzzing atmosphere mesmerises you immediately – all the tables were packed out with dates, parties, business meetings, you name it! The only downer to this lively environment was that every so often you would be able to hear a loud train passing right outside the establishment making it impossible to hear what your fellow diner is saying. BW and I were starving and relatively excited to try out the interesting menu meaning we ordered a lot of food just between the two of us. You all know me well by now that I’m a burgers and steak kind of gal so why on earth would I even think about ordering a salad? Well, what if I told you guys that this salad in particular consisted of sweet, juicy watermelon chunks mixed in with crunchy cashews and soft duck shreds. This was then further topped with a generous amount of mint and basil creating an absolute sweet and salty controversy in every bite. 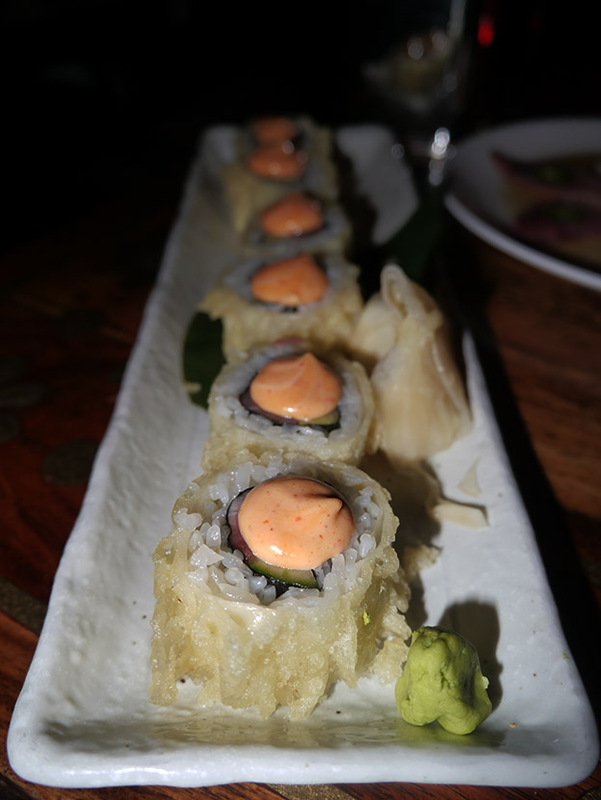 For those sushi lovers, these spicy tuna rolls were deep fried hence the “crispy” in the title. The sushi itself wasn’t the best spicy tuna roll I have tasted, but the fact that they were fully fried made it that extra bit tasty and BW, ever so kindly (more like no choice), let me finish the lot. 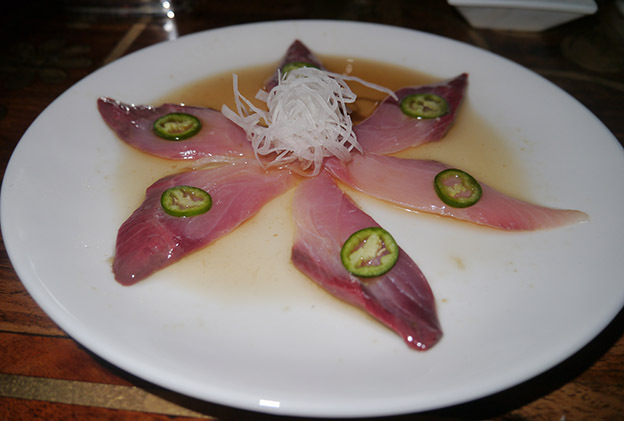 Six thick, meaty pieces of yellow tail topped with jalapenos and yuzu dressing were presented to us on a plate. The yellow tail was really fresh and you could tell this was high quality sashimi. It was certainly tasty and worth ordering. The chicken was fried to obtain the crispy exterior while maintaining a soft chicken interior. The chicken itself was bland and needed a big flavour punch which was where the black vinegar sauce came in. 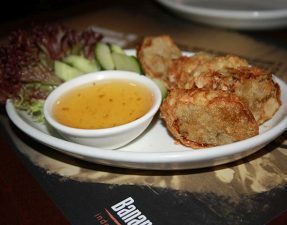 The crispy chicken skin soaked all the vinegar sauce in, however the sauce was too sour and didn’t add the slightest bit of flavour to the chicken meat itself. Not a choice for next time. 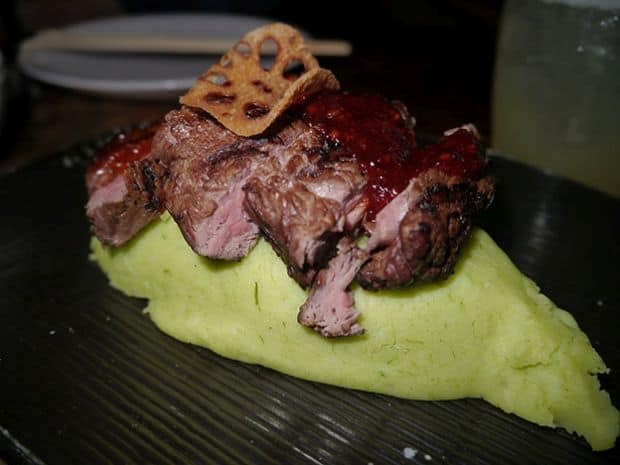 Hot, thick slices of sirloin steak cooked to a medium-well was placed on top of a big splodge of green mash potato and drizzled in sweet bulgogi sauce. At first, the bulgogi lacked taste, but then after a couple of more bites, that’s when it started to grow on us – especially when eaten with the mash and sauce together. Never had green mash before? Nor had I, but it tasted normal and complemented the platter well. And what exactly is bulgogi many of you may ask? It is…I myself have no idea, but it was delicious! Chilli Mango Salad I guess BW and I were feeling particularly healthy and ordered another salad. But this time it was from the spicy section of the menu that isn’t available on the online menu. (Its available on the menu in the restaurant). The waiter warned us of the spicy nature of this dish and double-checked with us just to make sure we actually wanted to order this salad. Of course we did – we both enjoy a challenge. 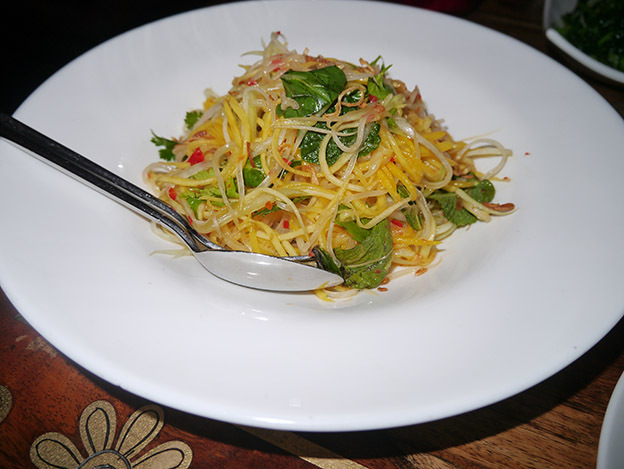 This salad was shreds of papaya and mango doused in hot chilli sauce, which initially didn’t seem to be too hot where you couldn’t enjoy the taste of the salad itself, but then on the other hand it had a rather spicy aftertaste to it. The dishes on the menu were certainly innovative, such as the prawn and banana spring roll (BW rejected this choice of mine – thanks! ), however there were certainly hit and miss moments. 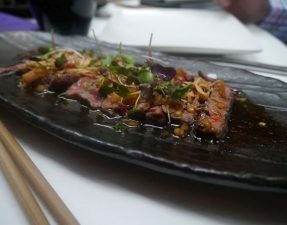 The starters were almost perfectly spot on with the duck salad being ever so tasty and the crispy spicy tuna rolls just being okay. 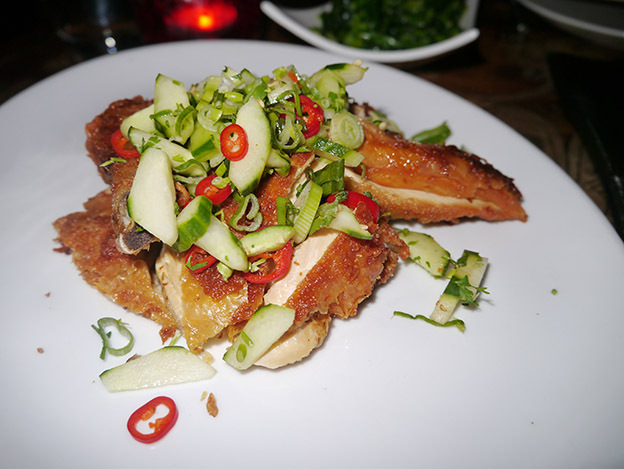 Looking back at the mains that we ordered, the crispy chilli chicken wasn’t an absolute miss but wouldn’t be ordered again unless some sort of balance was reached between the sour vinegar and the bland chicken. 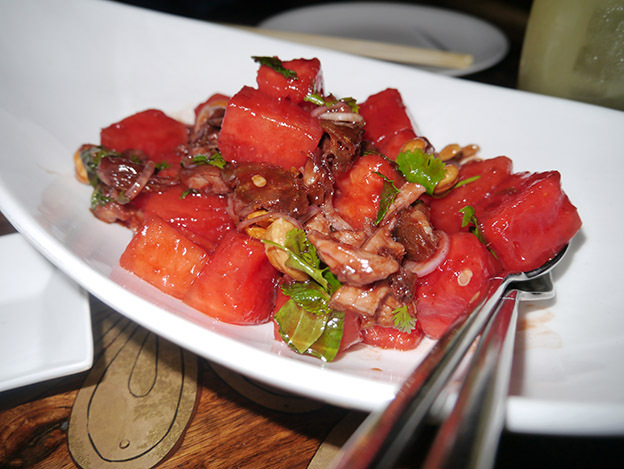 The bulgogi on the other hand was one of my favourites of the night along with the duck & watermelon salad. The damage was £133 between the two of us including average mocktails. Definitely overpriced for what we were served, but I just couldn’t get enough of the atmosphere and the detailing of the restaurant. For a bill that much, the food needs to guarantee almost perfect flavour and enjoyment every time. 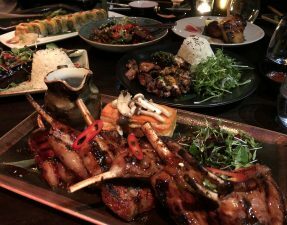 Despite these negatives, I would revisit Gilgamesh several times for three reasons: One, to try out all the other cool and creative dishes they offer on their menu such as the prawn and banana spring rolls! Two, to give me a reason to have an awesome and fun night out with the girls. And three, just so I can keep on reordering that amazing duck salad! In other words, Gilgamesh is worth trying out for a special occasion and is certainly on my list to revisit in the future. Halal status verified by the restaurant and certificates provided. – Halal status on chicken confirmed by restaurant. The beef is no longer halal since this review.